I didn't know in advance what I would be receiving so the first exciting thing was discovering what was in my (very safely packed) parcel. The smell from the box was great. 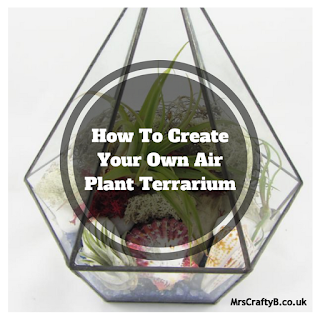 I couldn't wait to make my house smell like that instead of stinky boys (sorry boys!) and cooking. 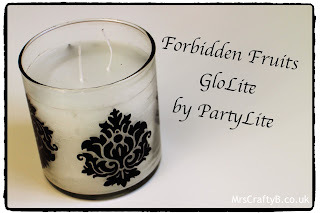 Inside I discovered a large box which was a Forbidden Fruits GloLite pictured below. The second product delivered much more that I expected. 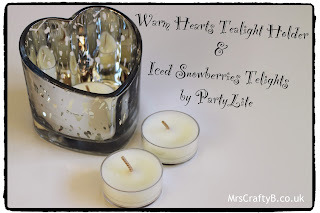 This was a Warm Hearts Tealight Holder and Iced Snowberries Tealights. I mainly use tealights and found the scent of these very strong and seasonal. Think Christmas. The holder however wouldn't be something that I would pick. That was of course until I lit a tealight in there! The mirrored interior along with the flecks of clear glass ensured that the light from a single tealight was maximised, emitting a beautiful glow which extended further than I have ever experienced with a bog standard tealight holder. I tried to captured this in the picture at the top of this post. Small things perhaps but I genuinely love this and I think I might look into getting another for my fireplace. It definitely made for a seemingly warmer environment on a chilly evening and the combination of that with the beautiful scent of the tealights were a winner for me. I highly recommend one of these holders if you are a tealight fan. 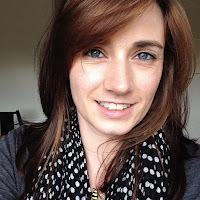 Overall I was a fan of the PartyLight products I received. I intend to restock the tealights and perhaps try some of their other products. 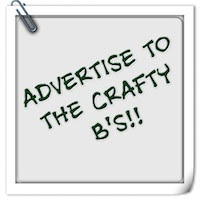 *I was sent these PartyLite products for the purpose of this review. All opinions are my own. 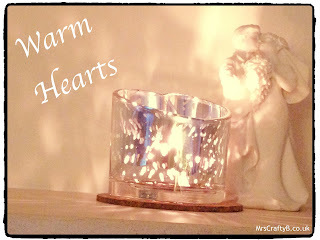 The warm hearts tea light holder is fabulous isn't it, one of my fave PartyLite purchases!!!! It's just a pretty effect isn't it?! I love it. They holder looks very nice with a lit candle inside, it's cute.